4 metres of lovely fabric and 6 metres of even lovelier ribbons from the Reprodepot Sale bin. 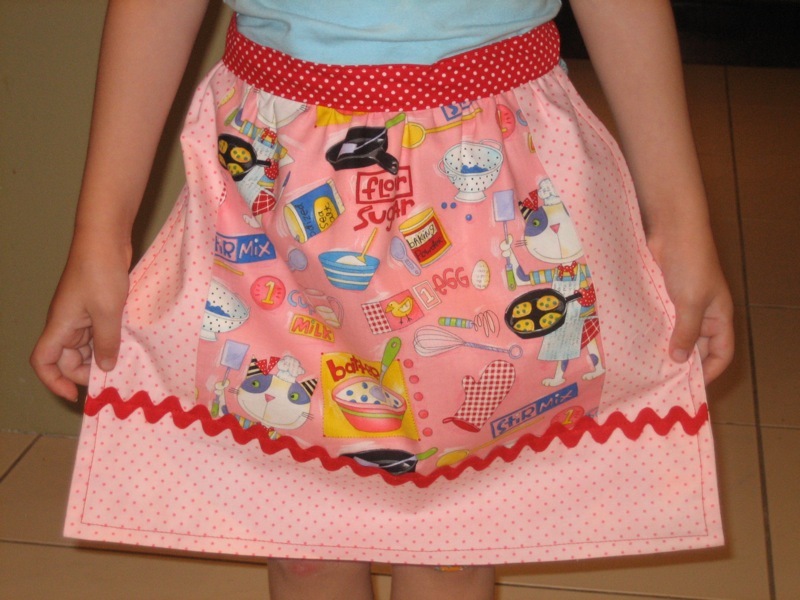 I think that they'd all look great sewn up into reversible apron dresses like this one on my little princess..... I made it up on Sunday night while I was down at Cootamundra visiting my Mum for her B'Day. It was super easy and to start with we were following a pattern but then decided to change a few things about it and designed our own pattern. I think I might have to add this one to my list of 'to do tutorials' (along with the coasters) what do you think??? My basil is growing out of control at the moment, which I'm not complaining about, so I've been looking for some yummy recipes to make with it. Helen came up with a brilliant idea here and she also makes this great "poor woman's pesto" which sounds super delicious. You just blend kalamata olives, lots of basil, toasted sunflower seeds and olive oil together into a paste and stir it trough pasta or use it as a spread on sandwiches. YUMMO!!!! I have 3 huge bushes like the one below that need some serious de-leafing soon..... If anybody has a recipe idea I'd love to try it out. Have you ever grown little yellow cherry tomatoes like these before?? I started growing them in my garden this year for the first time and they're absolutely BEAUTIFUL!!!! I can't remember the name of them and would love it if someone could help me out. My current plant is yielding about a dozen little treasures a day which is just perfect!! Not too many, just enough for a salad or to roast up and stir through a pasta sauce. On the doll quilt front, I finished, yippee!!!! I was just about to post it off when I thought I'd go check out my swap partners blog just one more time..... WELL!!!! It turns out that I've been checking out the wrong persons blog, BUGGER!!! It also turns out that my real swap partner REALLY doesn't like the country/shabby chic style of quilting which I've used here, she's more into a contemporary/traditional styled quilt.... Oh No!!!!! I've been seeing this gorgeous Japanese website around blog land lately and just had to share it with everyone. All Buttoned Up made some of the paper craft for her son over the weekend and it looks like he had a great time playing with it all, she's posted a pic on her blog. I'd love to make some for myself, they're just SO cute. I think that my little princess is a bit small for them at the moment but I'll make them up anyway. I've crammed a bit of everything into this post today, hope it hasn't blurred your vision..... LOL!!! OMG you have done two quilts in the time I have taken to come up with one!!! That is such a funny story - I better go and check on mine! And we should be getting a quilt soon - I always forget that bit and get a nice surprise! Jodie, thats hysterical. You are lucky you realised in time. At least you now have a spare! That is one WOWEE post! It's so full of good luvin'. Loved all the links and ideas - I think my best one for the basil would be pesto. wow you have been so busy!i love the little dress and blommers i think i have this pattern time to give it a go!i am growing little yellow toms as well called 'lemon drop', they are an heirloom variety through the Diggers Club.hope this helps! Ooooh I love the fabrics, and it's so much fun getting treats in the mail. The little dress is divine! I found you through the coaster swap and I see you are doing the quilt a long with amandajean too. I love the little dress on your little girl. That was always my favorite to make when my girls were small and now I get to make them form my granddaughters! I love those little tomatoes too! Your little one is so cute in her dress! These days I am watching the snow fall and planning my garden for spring. I am so envious of your gorgeous basil and tomatoes! We grew some Lemon Boy tomatoes last year and they are yellow also. They tasted wonderful! You can make LOTS Of pesto and freeze it for later use. Also, you can dry the basil. ohhhh my wow...everything looks soooo wonderful.... you rock. I love those little apron dresses - I used to put my girls in them all the time when they were wee!